A selection of our Russian Air Force related aircraft. A 1:100 scale model of the Sukhoi Su-27 - A twin-engine supermaneuverable fighter intended as a competitior for the U.S. fighters such as the F-14 Tomcat and F-15 Eagle. 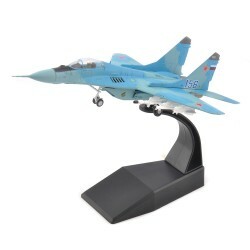 A 1:100 metal diecast scale model of the Mikoyan MiG-29 - A twin-engine jet fighter designed in the Soviet Union and developed during the 1970s to counter new U.S. fighters such as the F-15 Eagle and F-16 Falcon. 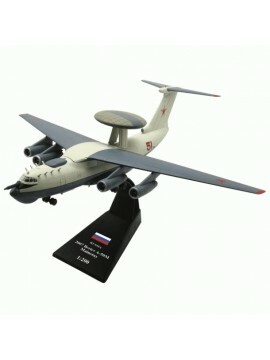 A 1:200 scale model of a Russian 2007 Beriev A-50M Mainstay - A Soviet airborne early warning and control aircraft, the A-50M variant is a modernized Russian version fitted with midair refueling capability. 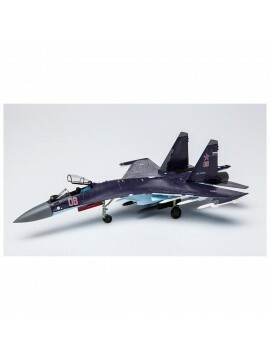 A 1/72 premium scale model of the Sukhoi SU-35 (Russian Air Force, Purple Scheme). The landing gear is removable and interchangeable, along with a range of weapons & ordnance supplied.